Potomac Valley Hospital was opened on October 9, 1931, for the care and treatment of medical, surgical, obstetrical, newborn arid pediatric patients under the ownership and management of Drs. Robert and Thomas Bess. They directed the operation of the Hospital until 1954 and participated in many activities to enrich the community. Dr. Robert Coffman owned and directed the Hospital from 1954 until 1958 when Robert W. McCoy, Jr., M.D. purchased the Hospital and managed it through 1980. Mr. Harold McBee Sr. and Mr. Willam Buzby purchased the Hospital and assumed management on January 1, 1981. Upon retirement Mr. Buzby in 1992, Mr. Harold McBee Sr. assumed sole ownership of the Hospital. Potomac Valley Hospital is a twenty five bed, critical access medical facility employing over two hundred area residents and extending privilege to approximately 50 physicians, and one general surgeon. The medical staff includes a rotating staff of Physicians specializing in Emergency Medicine who reside on the premises. In 2007 Potomac Valley Hospital open its new facility on Rt. 220. The new 48,000 square foot facility remained the same size as a 25 bed, Critical Access designation. While its overall size will not change, the new hospital will provide an opportunity to provide higher levels of care to the community, care that, in the past, people felt they had to leave town to receive. 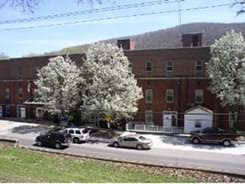 Potomac Valley Hospital strives to provide quality, efficient and cost effective health care to Mineral County and surrounding area, utilizing both direct services and collaborative arrangements with other health care organizations. In 2014 Potomac Valley Hospital was purchased by West Virginia University Health Systems, from Harold “Hal” McBee, who had owned the hospital for approximately 30 years. The sale to WVUHS will maintain and enhance healthcare in our community. It ensures the hospital will be here for the future, serving the needs of the people of our community. Potomac Valley Hospital has been accredited by the Joint Commission on Accreditation of Health Care Organizations since 1984 and is dedicated to your service. We are ready and equipped to provide the most modern health care available. We are committed to staying abreast of the advances being made every day in the medical field. In this way we can assure you that Potomac Valley Hospital will be technically updated, continually upgraded and capable of extending to this community the most modern health care available. Our Vision Statement promotes our goal and mission. Potomac Valley Hospital strives to promote wellness and to provide quality and compassionate care in a cost effective way for the people of our community.